Pair this headpiece with a full veil and/or blusher to offer structure to balance a frothy and feminine veil. When combined with a veil, the look embodies all that is opulent and regal. The Clarabel bridal tiara is made to order. Please allow 4 weeks for production plus delivery times. The Clarabel bridal tiara was designed to finish off a full wedding veil. We love to pair it with ladylike yet modern cap sleeves, illusion necklines, feminine sheer dresses, boho chic gowns, and floaty silhouettes. For an elusive look, we adore the Clarabel tiara with frothy veil such as the Amora, Aster, Wynter or Georgette. 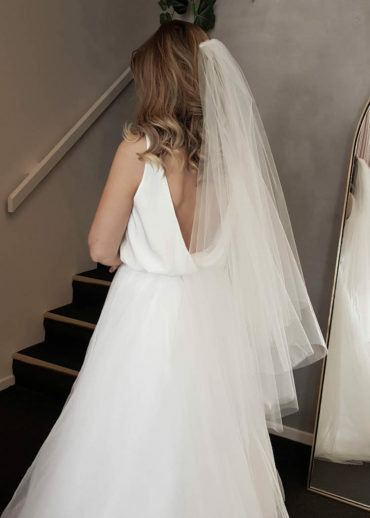 Browse our full veil collection or contact us and we’d be happy to offer a recommendation based on your wedding dress and hairstyle. We love to style the Clarabel tiara with all romantic hairstyles – loose curls, low set buns or half up hairstyles.